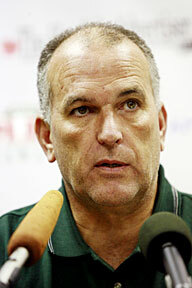 UH football coach June Jones said this recruiting class addresses needs. Hawaii football coach June Jones, accused often of overhyping his players, was uncharacteristically restrained yesterday while introducing his latest and greatest: In his NFL-educated opinion, only two of the new Warriors rate instant pro draft status. Rating them as a group, though, Jones made no outrageous claims regarding the recruiting class of 2006. "Overall, I think we have a good class," he said. Not the greatest. Not great. Just good. But Jones was upbeat. This year, the Warriors went shopping for necessities, not luxuries. Jones said the coaches brought home the basics, and then some. "I feel like we set out to address our needs, specifically, and I feel like we did that," he said. "I'm excited about some of the other kids' upside, too. ... For getting what we need, it's the best we've done." Of the 20 players Jones talked about yesterday, 15 or 16 are slated for defense. And eight of those are defensive backs. So are three others he couldn't talk about yet -- local high school products Kenny Estes and Afa Bridenstine and JC transfer Gerard Lewis. "Those corners from the junior colleges could have a big impact," said Jones, whose team is coming off a 5-7 season. "Right now, I think, the front seven defensively and all on offense, we're a pretty good football team. "The area we needed to improve was the back end. Losing (safety) Leonard (Peters to injury) against USC really hurt us. We played a lot of different people and went through a lot of different injuries. We just didn't have enough guys. I think we've addressed that. I would anticipate that the secondary players are all competing for starting jobs. Several players have been asked to defer their scholarships until 2007, but that can change depending on events in testing halls and high school classrooms in the next several weeks. 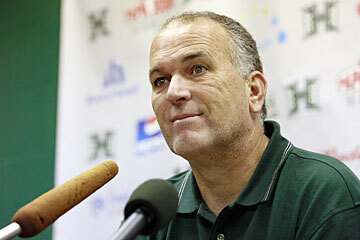 Hawaii coach June Jones says his staff accomplished his goal of filling needs this year. "It really hasn't been decided which ones will grayshirt and which ones won't," Jones said. "We have some guys that still have academic things to take care of. So some of the guys, potentially a year away, may be back in the picture very shortly." Did the Warriors lose any recruits who wanted to activate immediately rather than grayshirt? "I think there was probably two guys that did," Jones said. "I think that when it was all said and done, it was the best thing to do. We'd only done five or six since I'd been here. Sometimes people don't see it as a positive. But to get more time, extend school and get a chance to get a redshirt year that's not wasted. It is a positive thing." Po'okela Ahmad (6-2, 205, LB; Kapolei): "When I watched him on tape, I could not believe what I was looking at. He has speed and athleticism and I was surprised nobody else was on his bandwagon." Chris Camacho (5-10, 190, CB; Citrus College, Calif.): "Probably the best technique guy and most ready to play football. He has real good anticipation and he's a real smart kid." Mitch Farney (6-0, 185, WR; Phoenix, Ariz.): "I would project him to be a slot for us. He is a legitimate receiver as far as catching the ball and being able to break away." Brysen Ginlack (6-3, 275, OL; Kahuku): "He'll probably redshirt. He has the athleticism we like and he's working real hard in the weight room. He has a lot of upside." C.J. Hawthorne (5-11, 165, WR/CB; Mississippi Gulf Coast College): "He's an outside speed guy, but he could play corner, too. We'll leave it up to him. He'll be here in the spring and a lot of these other corners won't. So I told him if he wants to get on the field early, that might be the way. He may play both in the spring. He's a great kid with tremendous speed." Lucious Henderson (5-10, 170, CB/WR; McCallum, Austin, Texas): "We will start him out at corner. Because he looks like he can get the ball in the end zone, he may end up playing offense as well, but he has a chance to compete (at cornerback) as a freshman." Keenan Jones (5-11, 180, CB; Compton College, Calif.): "He's maybe as good a corner as I've looked at on film. Jerry (defensive coordinator Glanville) and I both said we'd draft him." Kiran Kepo'o (6-2, 220, QB; Iolani): "Kiran is competitive and an accurate passer who seems to have all the intangible things. He's been running a system similar to ours, so it was pretty easy to evaluate him in terms of being able to do what we need." Clayton Laurel (6-3, 255, DL; Leilehua): "He's so athletic. Very long arms." Jared Lene (6-4, 240, OL; Altus, Okla.): "Jared Lene will grow. I've known his dad for a long time, and he's a big guy. Weight's not going to be a problem. He's already strong and he's a hard worker. And he can run. He's our kind of guy." Waylon Lolotai (6-2, 215, LB; Centaurus, Lafayette, Colo.): "Cal (linebackers coach Lee) had known Waylon's father a long time, and he's a great kid. We're not sure yet, but he might go on a mission." Peyton Ma'o (5-11, 235, LB; Sinaqua, Flagstaff, Ariz.): "Peyton is probably the biggest hitter and most fundamentally sound defensive player on this roster. If I was in Atlanta right now I would've drafted this kid." Myron Newberry (5-9, 170, CB; Trinity Valley College, Texas): "He looks like the best man-to-man coverage guy, best bump-and-run, that we'll have. And he can run. He's very instinctive." Jacob Patek (6-2, 210, LB/S; Blinn College, Texas): "He was one of the best JC players we looked at. Texas A&M offered him, but pulled the scholarship and we were there at the right time." Elliott Purcell (6-3, 230, LB; Saint Louis): "I could see him stepping in as a starter (in 2007). He's going to get bigger and stronger." Greg Salas (6-2, 190, CB/WR; Chino, Calif.): "He's one of the most talented high school athletes we've brought in here. He's an unbelievable receiver, but also a great bump-and-run defender. He did everything for their high school." Spencer Smith (6-0, 180, S; Kell, Marietta, Ga.): "You could tell he was serious about (coming to Hawaii). He's a hitter." Rick Taylor (5-11, 177, WR; Nease, Ponte Vedra Beach, Fla.): "We grayshirted him last year. We saw his tape last year and he played in an offense like ours in high school." Alasi Toilolo (6-3, 230, DE; Kapolei): "He's the defensive end of the future, very athletic. He reminds me of Mel (Purcell) and Ikaika (Alama-Francis)." David Veikune (6-3, 235, DE; Fresno City College, Calif.): "He came back from Colorado and Fresno and has done nothing but work since. He'll gain more weight and be a productive player."